Broadly speaking, the blood sugar control of the body does not depend much on the amount of sugar or carbohydrates you have consumed, rather it is more dependent on the source of carbohydrates. Hello friends! This is Dr Biswaroop Roy Chowdhury and if you or any of your family member is a diabetes patient then you will be happy to know that I can help you cure diabetes. 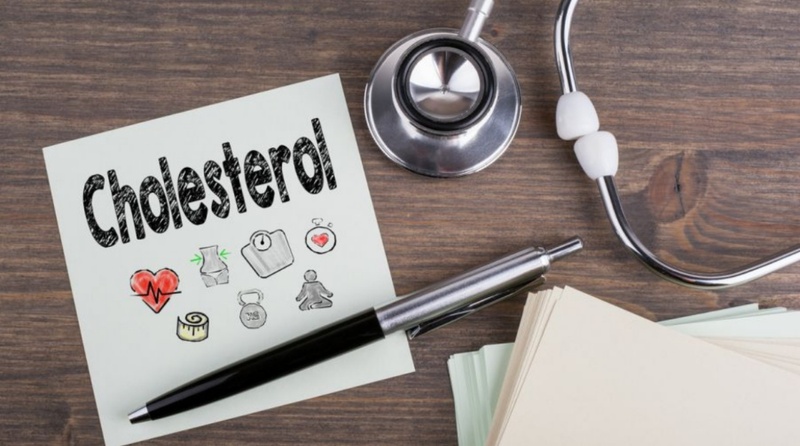 The knowledge of nutrition that you are going to read in this article will help you and your family members to be free of diabetes forever in just 3 days. I know some of you might already be an expert in nutrition having ample knowledge about food and nutrition but here I would request you to look at nutrition from an entirely different angle, an angle which will help you understand why some people are diabetic, and even reverse not only diabetes but also associated illnesses. 1. He may be using wrong key. 2. The key might have gotten destroyed or damaged. 3. Lock might have gotten damaged. 4. Something got stuck in the hole. 5. Person may not be skillful to open the lock. Little bit of sum of all the above factors contributed in the inability to open the lock. To unlock the door you have to approach the problem from all the above 5 angles. Same is true for Diabetes Type 1 and Type 2. Here we have to understand that we are made up of say 50 trillion cells and each of the cells to survive and perform its role in your survival needs energy, which it gets from the food you eat. But the food specially the carbohydrate cannot enter the cells as the door of the cells remains closed. 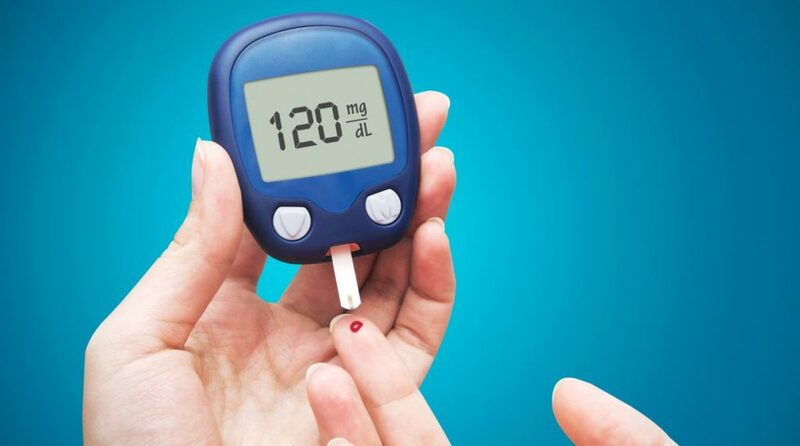 It is the insulin key, a type of chemical produced by pancreas which opens the door of the cell, so that the carbohydrates of the food may enter the cell and utilized for energy. Here the insulin represents the key which opens the cell so that the carbohydrate (the person operating the key) may enter the cell. As you know the main ingredient of the food we eat consists mainly of carbohydrate, protein and fats. This means to solve the problem we have to investigate all the 3 raw materials as we know in diabetes, carbohydrate is not able to enter the cell as the insulin is unable to open the cell lock, hence the cells starve to death leading to severe complications.To get to the solution of the above problem we have to investigate all the 3, i.e. carbohydrate, protein and fats. Carbohydrates: It is the most important source of energy found in every food you eat. However all the carbohydrates are not same. To understand, let’s take four varieties of food containing carbohydrates or its simpler version i.e. sugar as glucose or fructose. Carbohydrate from different sources dissolves in blood differently as shown in the illustration given below. The sugar from cold drinks or other beverages and breads, cakes, biscuits, shoots into the blood which means it is fast acting. 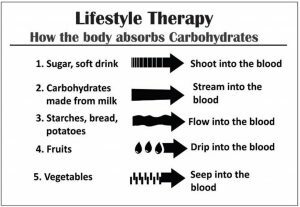 However the sugar/carbohydrate from the fruits, drops into the blood and that from raw vegetables seeps into the blood which means slow acting. ‘The slower, the better’. The food are ranked on the basis of its carbohydrate action with the blood. It is called the Glycemic index or Glycemic load. To understand the mechanism and the concept of Glycemic load let’s take a hypothetical example. 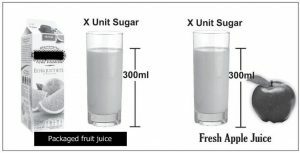 Imagine you have one glass of fresh apple juice (squeezed just now) and one glass of packaged apple juice and lets further assume both are having same amount of sugar (in reality a packaged juice on an average has 8 times more sugar, that too in refined form). Now imagine two persons with exactly same body parameters including BMI, age, fasting blood sugar level, HbA1C and the metabolism rate. The person A drinks a packaged fruit juice and person B drinks fresh apple juice. Now you already know that the blood at any point of time can hold only a limited amount of sugar (glucose), about 1 gm per liter of blood. Beyond that it can additionally have 50% tolerance in either direction. Any fluctuation beyond that range will lead to lot of catastrophic effects including formation of AGE, weakening of heart, overload on kidneys and also damage to many sensitive organs, including eyes, brain and even pancreas itself (as it plays a major role in the control of blood sugar in the body). 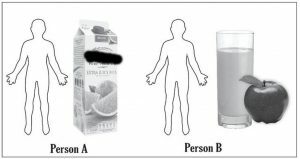 Person A : The moment he drinks packaged fruit juice, instantly the sugar will shoot through the intestinal wall into the blood vessels irrespective of the amount of sugar already present in the blood stream. The sugar from the packed fruit juice may appear identical chemical-structure-wise in comparison to the sugar from fresh apple juice, but is different behavior-wise. It acts unpredictably and is highly undisciplined. Such sugar is never considerate or friendly to the body. Person B: He is the consumer of the freshly squeezed apple juice. The sugar in this form is highly disciplined and law abiding. Imagine a scene of a law abiding citizen crossing a road. He will take into account the circumstances, understand the traffic flow, consider the distance he needs to travel to cross the road and mentally adjusts his travelling speed with ever changing speed of vehicle approaching him. It involves very minute calculations and no super computer of the world can perform it to the perfection as the human mind performs, that too effortlessly, day after day. This is one of the important skills which we have inherited, a must for our survival. The fresh and living juice also works in the similar manner. They are like a human brain which enters the body and before crossing the internal wall and entering into the blood stream considers various factors including the amount of sugar already present in the body. Conclusion : Broadly speaking, the blood sugar control of the body does not depend much on the amount of sugar or carbohydrates you have consumed, rather it is more dependent on the source of carbohydrates. Study 1: According to the study published in the Journal of American Medical Association (2002), carbohydrates from baked potatoes, yield greater Glycemic load than the carbohydrate from the boiled/raw potatoes. As I explained in the previous example that both the juices are having same source i.e. an apple, but the method involved during extraction of the juice and also the packaging changed the way the carbohydrate will finally work in the body. Study 2: Study published in Diabetes Care (Journal) – 2008, states that the glycemic index of the fresh and raw fruits and vegetables are much lower than any kind of food specially the processed food made of the same vegetable/fruits or the food from animal source. This means if your main diet consists of mainly fruits and vegetables rather than over cooked, processed food, your blood sugar level will be under control. Study 3: Canadian Trial of Carbohydrates in Diabetes (CCD), which tested high glycemic index (high GI) v/s low glycemic index (low GI) for over one year on change in HbA1C and C-reactive protein (CRP). The low GI diet significantly reduced CRP levels by 30% compared to the high G I diet. The trial was reported in American Journal of Clinical Nutrition (2008). Study 4: In 2007 Cochrane Review, was published the meta-analysis of six weight loss trials in which the total number of participants were 202 with a follow up time from 5 weeks to six months. The low GI diets promoted a significant weight loss of 1 kg, fat mass loss and a BMI reduction of 1.3 kg/m2 compared to high GI diet. There had been 100s of researches all across the world pointing to the fact that all carbohydrates are not same. What matters is the source of carbohydrate i.e. whether the carbohydrate is from the plant or the animal origin. Along with it, also matters whether the carbohydrates you are consuming is in its natural state or the state had been changed through various intermediate industrial processes before it enters your body. A significant research published in Current Atherosclerosis Reports-2010 demonstrated that the time of cooking is directly proportional to the increase in GI resulting in lot of burden on the blood sugar making a person more prone to diabetes. In the same research it was proved that the simple whole grain consumption in its natural state helps the diabetic patient to get a more stable and acceptable blood sugar. However, the refining followed by cooking of the grains rapidly shifts the grains from the low GI range to high GI range. The concept is very clear, that the grain which is the main source of carbohydrate in many societies, in itself will not be harmful for diabetic patients in any amount as long as it is in its natural state, however the change of state makes it the main player/culprit in increasing the diabetes patients in countries like India where rice and wheat are the main source of food. The influence of grains, particularly rice, on human body can be understood by the research published in Journal of Diabetes, 2009. In this study among 320 rural Bengalis, uniquely predisposed to developing diabetes and consuming more than 70% of their total diet as rice had significantly higher fasting glucose levels than those who were consuming regular food. In this study all the participants were eating refined & cooked rice. The total duration of the trial lasted for 5 years. 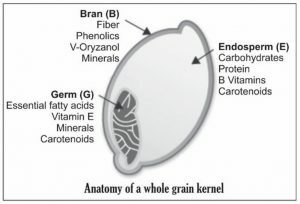 For greater understanding of the concept you have to consider the anatomy of a grain. Grains are highly nutritious in their unaltered form but are often mechanically refined and milled to remove bran and germ. This increases the palatability and shelf life. However, it drastically decreases the nutritional content. For example, white flour, which is mostly finely ground and bleached endosperm, has 80% less fiber, 30% less protein, and 10% more calories per gram compared to whole wheat flour (Whitney and Rolfes, 2008). With the loss of the bran and germ, refined flour is also stripped off important vitamins and minerals. For example, white flour is 60%-70% lower in thiamine (B1), riboflavin (B2), vitamin (B6), magnesium, and zinc compared to whole wheat flour (Whitney and Rolfes, 2008). Here, it is important to understand that wheat bran contains antioxidants, polyphenols and phyto-estrogens which helps in reducing inflammation, improve blood sugar stability as demonstrated by a research published in Nutritional Research Review Journal (2010). However the bran/fiber from a supplement will not produce a beneficial effect as can be understood through the research published in American Journal of Clinical Nutrition (2010). Food in its complete unrefined form with fiber intact, can only produce the beneficial effect. In the 1970’s Burkitt and Trowell, were the first to note that the African natives who consumed large quantities of unrefined whole plant foods had almost negligible cases of coronary heart diseases and diabetes. Even during World War I and II it was seen that many countries including Denmark, England and Germany who were deprived of the refined food because of scarcity of resources to process the food, the rate of diabetes and heart diseases reduced to 50%, but again returned to the initial high after the end of war when the supply of refined food resumed. Importantly, in a recent pooled analysis of 120,877 participants followed for over 20 years in the Nurses’ Health Study, strongly suggested that whole food (unrefined and unprocessed food) are important in preventing weight gain as reported in prestigious New England Journal of Medicine (2011). Conclusion: From all the evidence from highly regarded sources it is now clearly evident that it is not much important that how much carbohydrate a diabetes patient is consuming. Its rather more important to know that from which source the carbohydrate or its simple form i.e. glucose or sugar is coming and also the number of processes (cooking) it might have undergone before it is being consumed. This means carbohydrate from plant origin in its most natural state without any kind of cooking or processing is useful for human body at any amount. 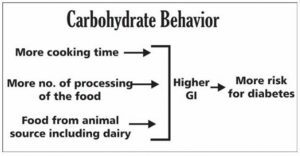 As you know that wild animals keep on grazing grass and eat plants the whole day but never become hyperglycemic even if there is over consumption of carbohydrates. So for solution of diabetes rather than focusing at reducing the dose of carbohydrate as cure, it would be more meaningful to consume the carbohydrate in an unrestricted amount from the plant based food, in a chemically unaltered state as is also indicated by American Journal of Clinical Nutrition (2008) article.